Thanks to a generous sponsorship from Regal, we are proud to award $5,600 to area schools through our 2019 Fittest School Challenge. The Fittest School Challenge was a competition between area schools that awarded winners based upon percentage of participation. Each child that participated in the March 30, 2019 Covenant Kids Run earned one point for their school. We tallied up each school’s respective points and divided that number by the total enrollment of that school to determine their participation percentage. We will award prize money to the top schools in a ten county radius. More than one school in each county will be eligible to win prize money. Posted in UncategorizedLeave a Comment on Fittest School Challenge Results are in! Results are in for the 2019 Fittest Company Challenge, presented by Humana! These nine companies will receive awards at a Knoxville Chamber function on May 21 at Fort Sanders Health and Fitness Center. Congratulations! For a listing of top companies, click here. Posted in UncategorizedLeave a Comment on 2019 Fittest Company Challenge Results! Posted in UncategorizedLeave a Comment on Bib Numbers Posted! Street and lane closures will occur throughout the center city and surrounding areas for the Covenant Health Knoxville Marathon race events, which will be held March 30-31. All roads are expected to be open by 2:30 p.m. Sunday, March 31. The Clinch Avenue Viaduct serves as the start for all races and will be closed to traffic starting at 2 p.m. Saturday until 2:30 p.m. Sunday. Parking will be prohibited on Clinch Avenue between 11th and 16th streets, and vehicles parked on the street will be towed Saturday evening. On Saturday, the Covenant Kids Run starts at 5:30 p.m., necessitating closures of 11th Street and World’s Fair Park Drive in front of the former Candy Factory building and Knoxville Museum of Art, and periodic closures of Clinch and White avenues between 11th and 13th streets and a small portion of 13th Street between Clinch and White avenues during the run. The 5K starts at 7 p.m. on Saturday with closures at Clinch Avenue between World’s Fair Park and 16th Street, portions of Volunteer Boulevard, Peyton Manning Pass, Phillip Fulmer Way and James Agee Street until about 8:30 p.m. 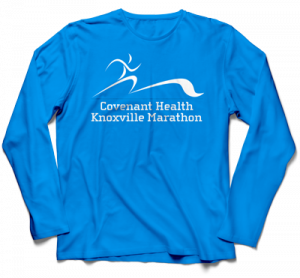 The Covenant Health Knoxville Marathon is a premier event organized by the Knoxville Track Club, a nonprofit 501(c)(3) organization dedicated to the encouragement of physical well being through running and walking. As we approach race day, here is IMPORTANT information for you and your child. There is plenty of free parking near the expo, race start, and race finish. Here are a few options for parking on race weekend. – Park in a city owned lot or garage. There are several within walking distance of the venue. We recommend both Market Garage and Locust Garage for Saturday. – 11th Street Parking Garage. This University of Tennessee owned garage is at the corner of Clinch and 11th Street and is one block from the start line and two blocks from the finish line. Children must pickup their t-shirt, bib, and goody bag at the Health and Fitness Expo on Saturday, March 30. Hours of the Expo are 9 am – 8 pm at the World’s Fair Exhibition Hall. NOTE: THIS IS A NEW LOCATION FOR US IN 2019! The address of the Expo is 935 World’s Fair Park Drive. NOTE: This is across from the Knoxville Convention Center and is located down the escalators from the Holiday Inn at World’s Fair Park. Feel free to come early and enjoy shopping and sampling from more than 60 exhibitors. As part of their registration, each child will receive 2 IDENTICAL bibs. BE SURE AND KEEP THIS DUPLICATE BIB ON YOU AT ALL TIMES. One bib is for the child to wear for the fun run; the duplicate is for ONE accompanying Parent/Guardian/Relative to wear if they choose to join the child on the course. If a parent chose to add an additional adult entry to the entry fee of their child (for the additional $5 fee), this enables a second Parent/Guardian/Relative to accompany the child on the course. This additional bib, which reads “PARENT” and has the child’s information on it, will also be available for pickup during Packet Pickup at the Health and Fitness Expo. (NOTE: If you did not choose to have an additional entry for a second Parent/Guardian/Relative to accompany during preregistration, you may purchase this additional bib at the Expo for $5). If a parent does not want to accompany their child on the course but will meet him/her at the finish line at World’s Fair Park, the parent STILL NEEDS to hold onto the duplicate bib. This will be their ticket to access the Festival Lawn and meet their child in the Parent/Child Reunite Area (see “Parent/Child Reunite Area at World’s Fair Park” Section below). NOTE: No child will be allowed to leave the lawn at World’s Fair Park Festival Lawn unless they have been checked by the Knoxville Police Department to have a matching bib with an accompanying parent or guardian. 4:30 pm – PHOTOS AT WFP AMPHITHEATER – Join us at 4:30 pm at the Amphitheater in World’s Fair Park for group photos/school photos. Our photographers will be on hand to assist and organize the schools. The Amphitheater is just outside the doors of the Expo and visible from the Start Line on the Clinch Avenue Bridge. 5:15 pm – START LINE – Children and families will need to head to the Start Line on the Clinch Avenue Bridge by 5:15 pm. Children will then line up in their respective wave in preparation for the start of the race. KIDS RUN COURSE FOR 2019! For safety reasons, parents and participants will immediately be directed through the finish chute to the designated reunite location on the Festival Lawn at World’s Fair Park. This area is for parents who are not running with their child, but instead will meet him or her on the field after the child’s finish. There will be LIMITED ACCESS to the field and parents MUST have the duplicate bib (as referenced in the section above) or “PARENT” Bib in order to gain access to the Parent/Child Reunite Area on the field. Before parents and children exit the festival lawn via the exit on the southwest corner of the lawn, volunteers will check to make sure that the bib number on the child and the bib number on the parent are an exact match. The Knoxville Police Department will patrol and assist in this exit area. Strollers will be allowed for the Covenant Kids Run (Strollers are NOT allowed for any of the Sunday races). For the safety of all participants, parents with strollers MUST line up in the very back of the last wave. Finally, HAVE FUN! We are looking forward to seeing you and your child on Saturday, March 30!